I am loving ticking things off the baby to do list week-by-week. Sam gets Mondays off whilst I’m at work and last week he saw someone giving a changing station away for free on one of our local Facebook selling sites. The bonus of him being off in the week is that he was able to respond to her ad quickly and pick it up that day – usually we miss out on items as we work normal hours most weekdays and those who work nights or are off work seem to bag all of the bargains! It was originally from a Mothercare-esque shop and it has a few small marks but nothing some paint won’t fix. I want to paint it white and yellow and then get some grey material with a white star pattern to line the drawer and shelves. We were never tempted to go out and spend a fortune on furniture for the baby’s room. We have never done it for ourselves (our huge pine triple wardrobe was a Gumtree steal at £80) and as we would want to paint the items anyway it seemed silly not to try and find decent second-hand items online or in charity shops. 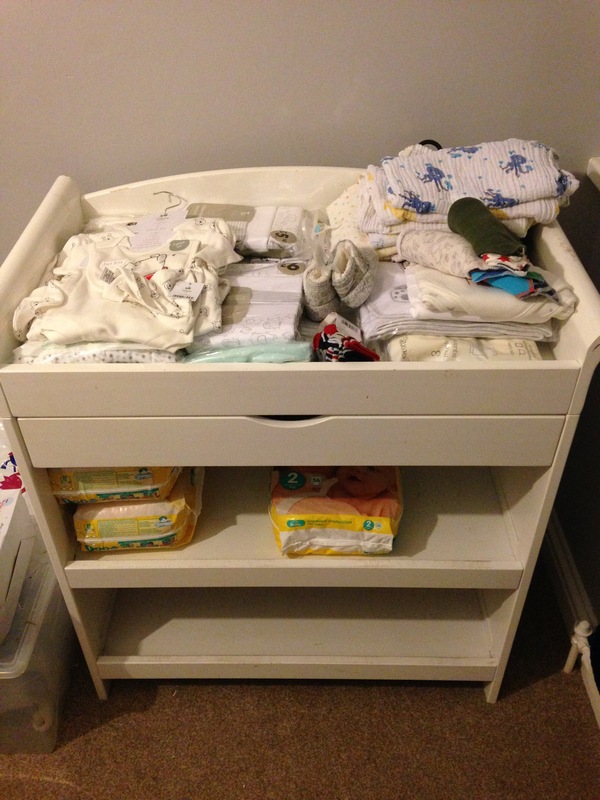 I’d just like a small set of drawers now for the baby clothes so am keeping my eyes peeled for any adverts. We also have a couple of beautiful things to put on the wall in the baby’s room already. My little Sister Sabra has always been very creative and artistic and has recently taken up papercutting. She made us a framed “Twinkle twinkle little star” papercutting that we love and I can’t wait to decide where it will go in the room. 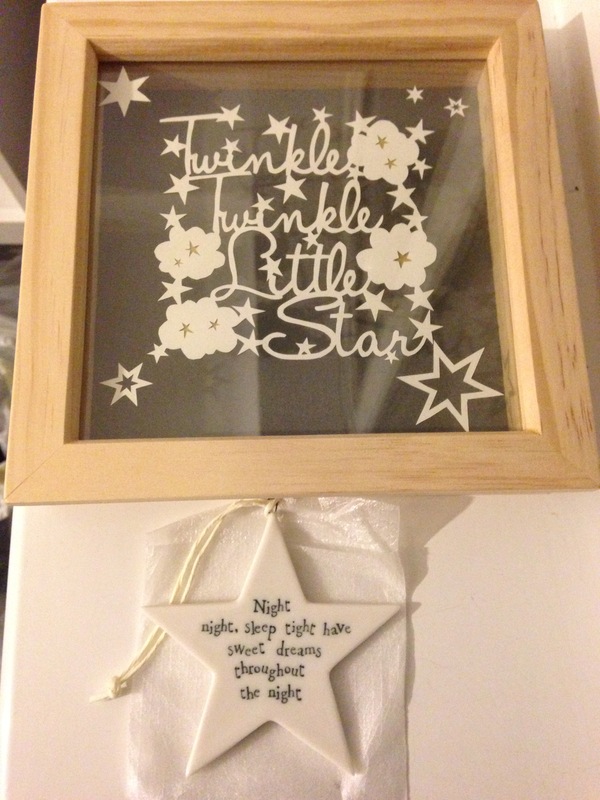 My friend Emily also got us something for the wall that fits really well with the theme – a little white ceramic star with the words “Night night, sleep tight have sweet dreams throughout the night” on. We are very lucky to have such caring friends and family to make the baby’s room extra special. I have a plan to make a colourful Alphabet wall by buying some wooden letters on eBay (I am “watching” a few sets and just need to decide which to buy this month!) then decorating them along with giving a few to family and any interested friends to make a cool feature wall. I saw the idea of Pinterest and instantly loved it and how personal it was too with each decorator’s personal style being included in the room easily. I can’t wait to share photos on here once it is done!